Don't you just love exploring and discovering new places? Well that's exactly what we were doing in Edinburgh last week when we were staying in an area we weren't familiar with, Stockbridge, and discovered all sorts of wonderful cafes, shops and galleries. The first gallery we walked into was Alpha Art and it was the morning after the preview of Jack Frame's exhibition with them. We weren't familiar with his work but one of his paintings, like the piece shown to the left, was hanging in the gallery window. 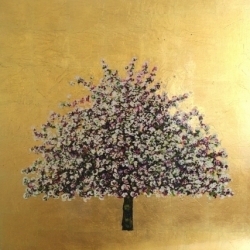 I have to admit I never thought I would be so taken with the use of gold leaf and silver leaf in paintings but this this works so wonderfully,deliciously well in his blossom series. He also paints his trees with a more traditional landscape background which have a beautiful high gloss finish to them with a tinge of sepia from the shellac. Such a find this gallery but also to discover another artist which we love so much… so much so we purchased this little painting which we are absolutely in love with. Now to find a place to hang it…. doh so many lovely paintings and not enough wall space! So if you are in Edinburgh do take a stroll around Stockbridge and marvel at the beautiful architecture, have a bite to eat in Henri's and take home some of their wonderful salted butter… !! !